A web thread of information for people who would like to go hawk watching for the first time. The largest hawk migration database in the world, HawkCount provides a guide to more than 200 hawk watch sites across North and Central America, including specific coordinates for and directions to each site. A site profile for each site includes a calendar of migration for each species at the site, showing the largest daily, and the largest, smallest, and average flights for each species seen at the site. The web site provides daily reports along with monthly and seasonal summaries for active hawk-watch sites across the continent, and annual totals for each species for the history of the site’s data on HawkCount. Data for all regularly covered spring and fall sites in eastern Massachusetts since 2002, including daily breakdowns and monthly and seasonal summaries, are available on HawkCount. Data for Massachusetts sites prior to 2002 is available from Paul Roberts at phawk254@comcast.net. HawkCount also provides links to the most recent Raptor Population Index (RPI) analysis for species at that site. By the NorthEast Hawk Watch (2008). 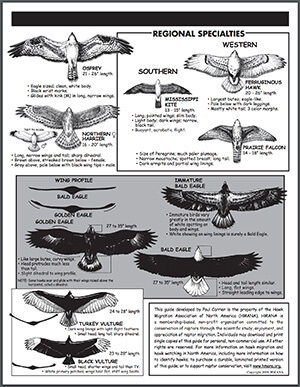 This two-page guide shows soaring silhouettes and key field marks for the migratory hawks regularly seen in the northeastern United States and eastern Canada. You can download and print the guide free for personal, noncommercial use, or order a special laminated printed edition designed for heavy use in the field for only $5. Individual and bulk ordering information is also available. 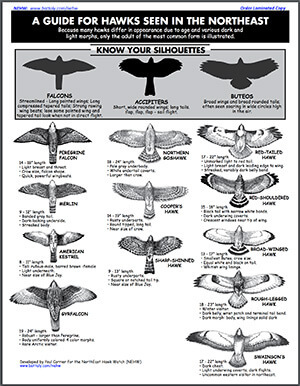 By the Hawk Migration Association of North America (2009). An expanded version of the Northeast guide, this new two-page guide shows soaring silhouettes and key field marks for 21 migratory hawks regularly seen in most of North America. You can download and print the guide free for personal, noncommercial use. You can also purchase a special laminated edition designed for heavy use in the field ($5). Individual and bulk ordering information is available from HMANA. By Bob Pettit, Holiday Beach Migration Observatory. This presentation highlights recognizing hawk types, their flight characters, and assists in discovering flight ID (identification) clues. You will view ‘slides’ of the common eastern migrant raptors in flight and read narratives of their flight mechanics as indicators of identification. A review quiz is included. 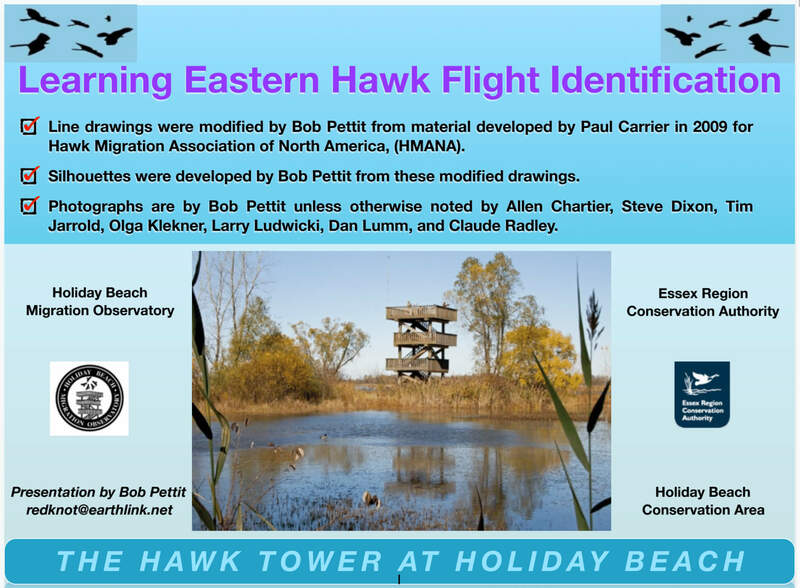 By Bob Pettit for the Hawk Migration Association of North America (c. 2014). 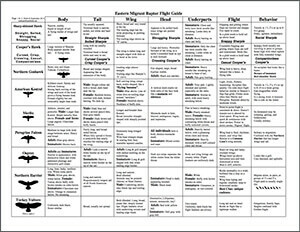 A two-page crib sheet that describes each migrant species seen in the northeastern quadrant of North America by body, tail, wing, head, under parts, flight, and behavior.